Blondie and Brownie: April at the Shack! One of Blondie's favs, the Strawberry Blonde (natch) is back on Wednesdays. But I have to admit that the two I'm most interested in trying are Fluffernutter (Fridays) and Pancakes and Bacon (Saturdays). I wonder if the Pancakes and Bacon is the same as the Pancake Custard with Bacon topping that Blondie had way back when. we shared a scoop of the pancakes & bacon on saturday. sadly there were no bacon chunks in it. i only got a sweet cream/pancakey flavor out of it, but the girlfriend also got some bacon flavor, but not much. someone should tell Danny that you can never be heavy handed with bacon. Oooh very excited about these custard flavors! What is the Strawberry Blonde exactly?? Too bad about the pancakes and bacon flavor... Wouldn't it be amazing with big chunks of pancake and bacon in it? And candied nuts too? Maybe some orange zest?? Boo, too bad. After reading your blog, I thought you would be interested in attending the once-in-a-lifetime Celebrity Chef Tour dinner in New York, NY on April 8th—a chance to enjoy a spectacular meal and interact with some of America’s top culinary talents. The April 8th event features celebrity chef Michael Schlow and host chef Ben Pollinger. This dinner replicates a dinner at the historic Beard House. If you have a Visa Card that simply says 'Signature' across it, you could be one of the 26 million Visa Signature cardholders to receive preferred pricing. In addition, when you use your Visa Signature card, you will have the opportunity to experience a unique four to five course dinner including wine and beer pairings, hors d'oeuvres, and a special appearance and Q&A session with celebrity chefs. It's sure to be an unforgettable evening. Learn more about this evening and additional Visa Signature offers at http://usa.visa.com/personal/visa-signature/celebrity-chef.jsp. @steven: no bacon pieces?! booo. I was hoping it might be a little more reminiscent of the Lumberjack concrete: http://newyork.seriouseats.com/2009/05/shake-shack-upper-west-side-nyc-lumbershack-concretes.html they did at the Upper West Side branch last May. @jessica: I couldn't agree more! We need some intel on that fluffernutter flavor stat! If you've had it, please do tell. I love Shake Shack myself and the custard flavors sounds awesome! Their milkshakes are great. If you love sweets and desserts, check out Baking for Good, online-based store. Their menus range from chunky white chocolate macadamia cookies and chewy gingersnaps, to rich mocha fudge brownies. We're currently featuring a 50% off deal- $50 worth of sweets for only $25! I also tried the Fluffernutter yesterday - I was gone for two weeks, so I had some catching up to do. It tasted fine to me. 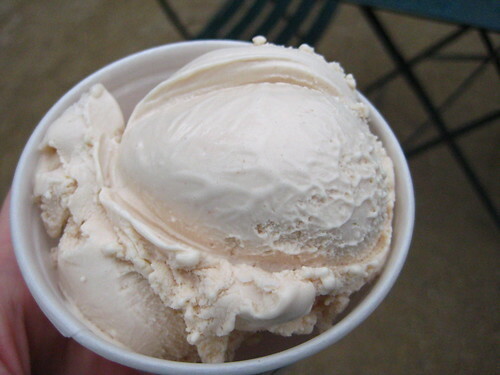 A good balance of marshmallow sweetness with peanut butter. I ended up going for scoop topped with shortbread cookies and bananas - sort of of classic combo. *And there's still one more Friday to try the flavor.